Two of Notre Dame's 2017-18 Fulbright winners: Political science and Arabic major Sara Abdel-Rahim ('17) and theology Ph.D. candidate Aaron O'Connor, who received grants to conduct research in Greece and Jordan, respectively. 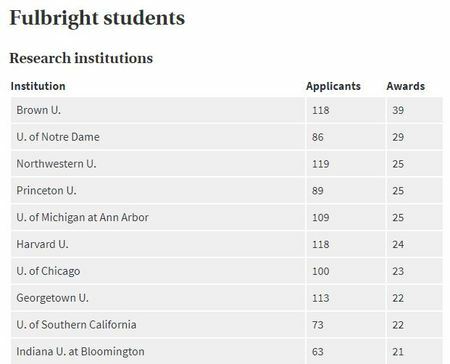 This is the fourth consecutive year that Notre Dame has been recognized as a top Fulbright producer, as reported annually in the Chronicle of Higher Education. The University counted 27 Fulbright students last year, tied for second among all research institutions in the U.S.
Undergraduate students interested in learning more about the Fulbright Program can visit cuse.nd.edu/fulbright. Graduate students can visit graduateschool.nd.edu/graduate-training/research-communication/the-office-of-grants-and-fellowships. Originally published by Erin Blasko at news.nd.edu.